You've bought your iPad and gone through the steps to set it up so that it is ready to use. Now what? For new iPad users who have never owned an iPhone or iPod Touch, simple things like finding good apps, installing them, organizing them or even deleting them might seem like an insurmountable task. And even for users that know the basics of navigation, there are tips and tricks that can help you be more productive using the iPad. That's where iPad 101 comes into play. The lessons in iPad 101 are targeted at the new user who needs help doing the basics, like navigating the iPad, finding apps, downloading them, organizing them or simply getting into the iPad settings. Did you know that tapping an app may not be the fastest way to launch it? If the app is on the first screen, it may be easier to find, but as you fill your iPad up with apps, finding the particular one you are interested in can be a chore. We'll take a look at some alternative ways to launch apps rather than hunting for them. Most navigation on the iPad is done with simple touch gestures, such as touching an icon to launch the application or swiping your finger left or right across the screen to move from one screen of app icons to the next. These same gestures can do different things based on the application you are in, and usually, they have their roots in common sense. The Swipe: You will often hear reference to swiping left or right or up or down. This simply means to place the tip of your finger on one side of the iPad, and without lifting your finger from the display, moving it to the other side of the iPad. So if you start on the right side of the display and move your finger to the left, you are "swiping left". On the home screen, which is the screen with all of your apps on it, swiping left or right will move between pages of apps. The same gesture will move you from one page of a book to the next while in the iBooks application. Apple's design is to have as few buttons on the exterior of the iPad as possible, and one of the few buttons on the outside is the Home Button. This is the circular button at the bottom of the iPad with the square in the middle. 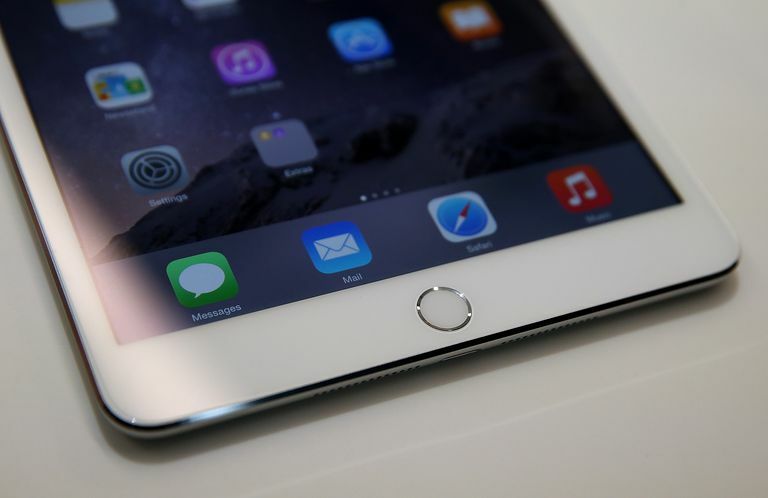 The Home Button is used to wake the iPad when it is sleeping. It is also used to exit out of applications, and if you have put the iPad into a special mode (such as the mode that allows you to move application icons), the home button is used to exit that mode. You can think of the Home Button as the "Go Home" button. Whether your iPad is sleeping or you are inside of an application, it will take you to the home screen. But the Home Button has one other very important feature: It activates Siri, the iPad's voice recognition personal assistant. We'll go into Siri in more detail later, but for now, remember that you can hold the Home Button down to get Siri's attention. Once Siri pops up on your iPad, you can ask her basic questions like "What movies are playing nearby?" After a while, you will start filling your iPad up with a lot of great apps. Once the first screen is full, apps will begin appearing on a second page. This means you will need to use the Swipe Left and Swipe Right gestures we talked about to move between pages of apps. But what if you want to put the apps in a different order? Or move an app from the second page to the first page? You can move an iPad app by placing your finger on the app's icon and holding it down until all of the icons on the screen start jiggling. (Some icons will also show a black circle with an x in the middle.) We will call this the "Move State." While your iPad is in the Move State, you can move icons by holding your finger down on top of them and simply moving your finger without lifting it from the screen. You can then drop it into another spot by lifting your finger. Moving an iPad app to another screen is a little trickier, but uses the same basic concept. Simply enter the Move State and hold your finger down on the app you want to move. This time, we'll move our finger to the right edge of the iPad's screen to move it over one page. When you get to the edge of the display, hold the app in the same position for one second and the screen will move from one page of apps to the next. The app icon will still move with your finger, and you can move it into position and "drop" it by lifting your finger. When you are finished moving iPad apps, you can leave the "move state" by clicking the Home Button. Remember, this button is one of the few physical buttons on the iPad and is used to let you exit from what you are doing on the iPad. Once you've mastered moving apps, deleting them is very simple. When you entered the Move State, a gray circle with an "x" in the middle appeared on the corner of some apps. These are the apps you are allowed to delete. (You can't delete apps that come with the iPad such as the Maps app or the Photos app). While in the Move State, simply tap on the gray button to initiate the delete process. You can still flip from one page to the next by swiping left or swiping right, so if you aren't on the page with the app you want to remove, you don't need to exit the Move State to find it. After you tap the gray circular button, you will be prompted to confirm your choice. The confirmation window will include the app's name so you can be certain you are deleting the right one before you tap the Delete button. While talking to your iPad may seem a little odd at first, Siri is not a gimmick. In fact, she can be an invaluable assistant once you learn how to get the most out of her, especially if you aren't already an extremely organized person. First, let's introductions. Hold the Home Button down to activate Siri. You'll know she's listening when the iPad beeps twice and changes to a screen that reads, "What can I help you with?" or "Go ahead I'm listening." When you get to this screen, say, "Hi Siri. Who am I?" If Siri is already set up on the iPad, she will respond with your contact information. If you haven't set up Siri yet, she will ask you to go into the Siri settings. On this screen, you can tell Siri who you are by tapping the "My Info" button and choosing yourself from your Contacts list. Once you are done, you can close out of Settings by clicking the Home Button and then re-activate Siri by holding the Home Button down. This time, let's try something that is actually useful. Tell Siri, "Remind me to go outside in one minute." Siri will let you know she understood by saying "Okay, I will remind you." The screen will also show the reminder with a button to remove it. The Reminders command may be one of the most useful. You can tell Siri to remind you to take the trash out, to bring something with you to work or to stop by the grocery store to pick something up on the way home. You can also use Siri to schedule events by saying, "Schedule [an event] for tomorrow at 7 PM." Instead of saying "an event", you can give your event a name. You can also give it a specific date and time. Similar to the reminder, Siri will prompt you to confirm. Siri can also perform tasks like checking the weather outside ("Weather"), checking the score of the game ("What was the final score of the Cowboys game?") or find a nearby restaurant ("I want to eat Italian food"). Now that we've met Siri, we'll go over a few ways to launch apps without hunting through page after page of icons to find a specific app. Perhaps the easiest way is to simply ask Siri to do it for you. "Launch Music" will open the Music app, and "Open Safari" will launch the Safari web browser. You can use "launch" or "open" to run any app, although an app with a long, hard-to-pronounce name might cause some difficulty. But what if you want to launch an app without talking to your iPad? For example, you want to look up a familiar face from a movie you are watching in IMDB, but you don't want to disturb your family by using voice commands. Spotlight Search may be one of the most underused features of the iPad, mainly because people either don't know about it or simply forget to use it. You can launch Spotlight Search by swiping down on the iPad when you are ​on the Home Screen. (That's the screen with all of the icons.) Be careful not to swipe from the top edge of the screen else you will launch the notification center. Spotlight Search will search your entire iPad. It will even search outside of your iPad, such as popular websites. If you type in the name of an app you have installed on your iPad, it will appear as an icon in the search results. In fact, you will probably only need to type in the first few letters for it to pop up under "Top Hits." And if you type in the name of an app you don't have installed on your iPad, you will receive a result that allows you to view that app in the App Store. But what about an app you use all the time like Safari or Mail or Pandora Radio? Remember how we moved apps around the screen? You can also move apps off the dock at the bottom of the screen and move new apps to the dock in a similar manner. In fact, the dock will actually hold six icons, so you can drop one without removing any that come standard on the dock. Having frequently used apps on the dock will keep you from hunting them down because the apps on the dock are present no matter which Home Screen page your iPad is on at the moment. So it's a good idea to put your most popular apps on the dock. You can also open a special version of Spotlight Search by swiping from left to right when you are on the first page of the Home Screen. This will open a version of Spotlight Search that includes your most recent contacts, recent apps, quick links to nearby stores and restaurants and a quick glance at the news. You can also create a folder of icons on the iPad screen. To do this, enter the "move state" by touching an iPad app and holding your finger down on it until the app icons are jiggling. If you recall from the tutorial on moving apps, you can move an app around the screen by keeping your finger pressed down to the icon and moving the finger on the display. You can create a folder by 'dropping' an app on top of another app. Notice that when you move an application's icon on top of another app, that app is highlighted by a square. This indicates that you can create a folder by lifting your finger, thereby dropping the icon on it. And you can put other icons in the folder by dragging them to the folder and dropping them on it. In the future, you can just tap the folder icon to get access to those apps. When you are in the folder and want to exit out of it, simply press the iPad home button. The home is used to exit out of whatever task you are currently doing on the iPad. You can also place a folder on the Home Screen dock similar to placing an app on it. This is another great way at getting to your most popular apps without resorting to asking Siri to open them or using Spotlight Search. With over a million apps designed for the iPad and many more compatible iPhone apps, you can imagine that finding a good app can sometimes be like finding a needle in a haystack. Luckily, there are several ways to help you find the best apps. Featured Apps. The first tab on the toolbar at the bottom of the App Store is for featured apps. Apple has chosen these apps as the best of their kind, so you know they are of higher quality. In addition to the featured apps, you'll be able to see the new and noteworthy list and the Apple staff favorites. Top Charts. While popularity doesn't always mean quality, it's a great place to look. The Top Charts are divided into multiple categories that you can choose from the top-right side of the App Store. Once you've chosen the category, you can show more than the top apps by swiping your finger from the bottom of the list towards the top. This gesture is commonly used on the iPad to scroll down lists or down the page on a website. Sort By Customer Rating. No matter where you are in the App Store, you can always search for an app by typing into the search box in the top-right corner. By default, your results will sort by 'most relevant', which might help you to find a specific app, but doesn't take into account quality. A good way to find the better apps is to choose to sort by the ratings given by customers. You can do this by tapping "By Relevance" at the top of the screen and choosing "By Rating". Remember to look at both the rating and how many times it has been rated. A 4-star app that has been rated 100 times is far more reliable than a 5-star app that has only been rated six times. Once you've found your app, you'll need to install it on your iPad. This requires a few steps and consists of the iPad both downloading and installing the app on the device. When it is finished, the app's icon will appear towards the end of your other apps on the iPad's home screen. While the app is still downloading or installing, the icon will be disabled. To download an app, first touch the price tag button, which is located near the top of the screen just to the right of the app's icon. Free apps will read "GET" or "FREE" instead of displaying a price. After you've touched the button, the outline will turn green and read "INSTALL" or "BUY." Touch the button again to start the install process. You may be prompted for your Apple ID password. This can occur even if the app you are downloading is free. By default, the iPad will prompt you to enter a password if you haven't downloaded an app within the last 15 minutes. So, you can download several apps at one time and only need to enter your password once, but if you wait too long, you will need to enter it again. This process is designed to protect you in case someone picks up your iPad and attempts to download a bunch of apps without your permission. Now that you have the basics out of the way, you can dive right into the best part of the iPad: using it! And if you need ideas on how you can get the most out of it, read about all the great uses for the iPad. Still confused by some of the basics? Take a guided tour of the iPad. Ready to take it a step further? Find out how you can personalize your iPad by choosing a unique background image for it. Want to connect your iPad to your TV? You'll know find out how in this guide. Want to know what to watch once you have it connected? There are a number of great apps to stream movies and TV shows available for the iPad. You can even stream movies from iTunes on your PC to your iPad. How about games? Not only are there a number of great free games for the iPad, but we also have a guide to the best iPad games. Games not your thing? You can check out 25 must-have (and free!) apps to download or just look through our guide to the best apps.